Find out more about the relevance of a sacred symbol and chanting sound - worldwide and in Balinese Hinduism. 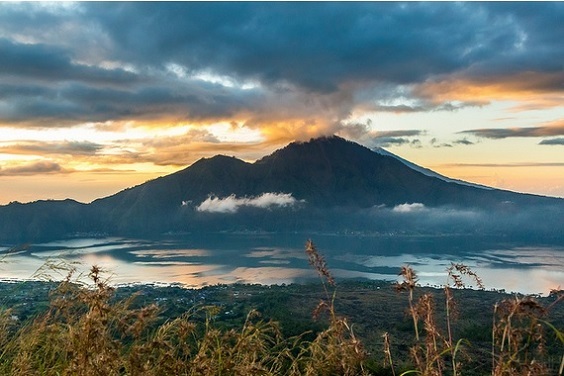 Bali is home to one of the most spiritual and ancient cultures in the world. Then, it’s not a coincidence that Bali is known as the Island of Gods. The most practiced religion is Balinese Hinduism, called Agama Hindu Dharma, a unique form of Hindu worship woven together with local animism and reverence for the ancestors and Buddhist saints. This article will explore the most important sound that can be heard during mantra chanting and the most important symbol for Hindu: the sacred symbol of “Om", its universal meaning, its origin and its role in Balinese Hinduism. 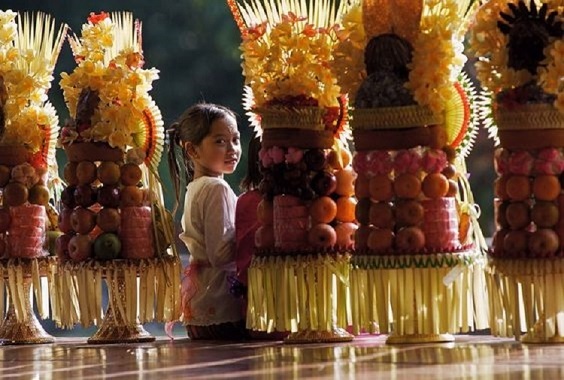 Religion, culture and everyday life are one in Bali. Over the year, time is regulated by three calendars, which, interlaced together, determine the hundreds of ceremonies happening over the course of the year. 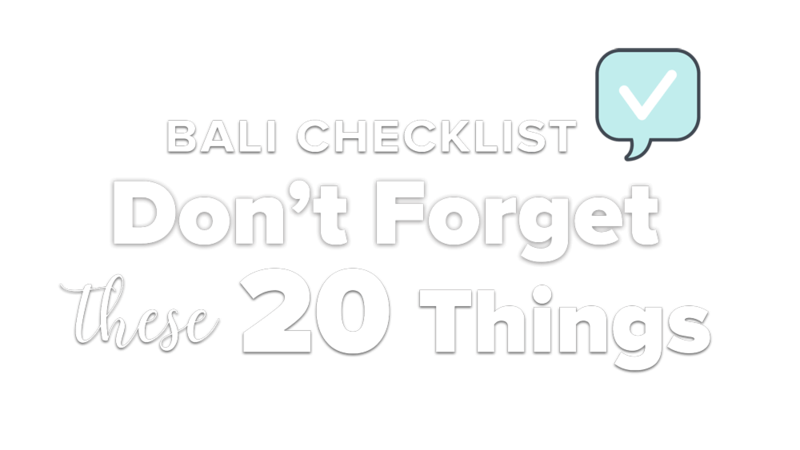 For Balinese, there is a day for everything. A blessed day for harvesting, for getting married, for carving wood and even for appreciating cars and motorbikes, known as “metal day”. And the list can go on. Every little and simple gesture of daily life is laden with profound meanings, tracing back thousands of years. Spirituality here is timeless and during your visit you’ll most likely have the chance to experience one of the ceremonies. 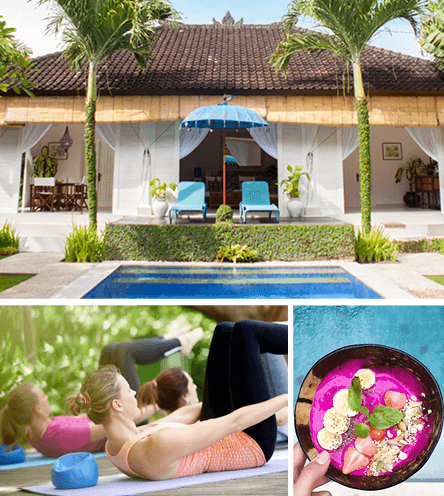 Read more about Balinese culture, religion and ceremonies. What are the origins and blissful meanings of the Om symbol and sound? 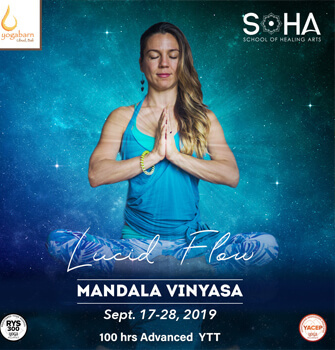 Om is the “original sound of the world.” In yoga practice, the sound of “Om” and the mantra “Om Shanti Om” is recited at the beginning and at the end of the practice. It is employed both as a symbol and as a sound in prayers, ritual chanting, sacred performances, yoga and tantra practices. 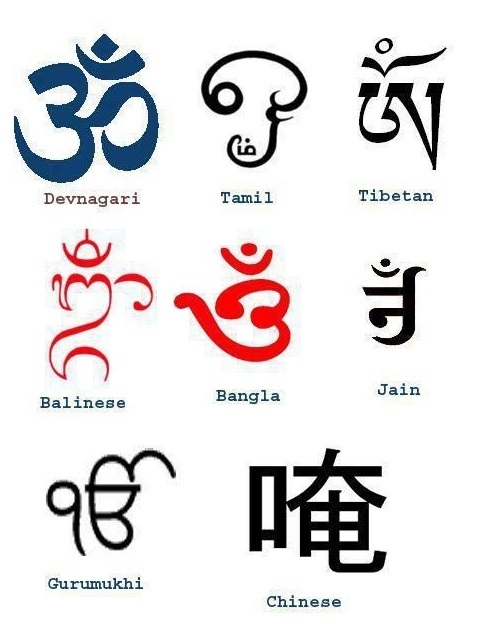 See here the symbol of Om in different skripts, including the Balinese Om. In the Hindu religion it is considered as Brahman, the highest Universal principle and ultimate reality in the universe, in the form of askshara (word) and sound. There are several stories about its possible origin. Some sources state that the word might stem from an ancient Indian ascetic tradition and then it was integrated into the Vedic religion. The Upanishad Chandogya, one of the oldest Sanskrit texts of the Sama Veda of Hinduism, tells us the story of how the sound Aum was spoken by the god Brahma while he was meditating over the world he created. That is why Aum symbolised the whole creation of the world. When pronounced, after the “M”, at the end of the AUM there’s silence. A pause that represents a fourth state: turiya, or infinite consciousness. In Hindu philosophies it is common to find divine triads. For example, the three realms of sleeping just explained above; the three most important Hindu Gods and Goddesses, three Vedic scriptures. The symbol of AUM represents such trinity as well, where “A” stands for Brahma, the Creator; “U” for Wisnu, the Preserver of Life; and “M” for “Siwa” the Destroyer. Holy trinities are key to understand Hindu philosophies and cultures. 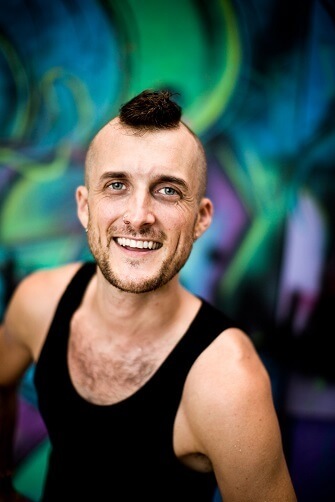 In the tradition of Balinese Hinduism, “three” is a recurrent and crucial number. For example, Tri Hita Karana - literally “three causes of wellbeing” or “three reasons of prosperity” is the core principle that regulates everyday life on the island: to live in harmony 1) among people, 2) with nature, 3) with God. 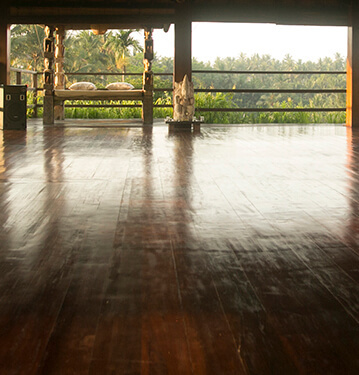 The principle determines daily rituals, the gotong-royong community practice and even spatial organisation. Based upon the Tri Hita Karana, the Tri Angga is the principle that orders architectural structures in Bali. Tri Angga is a three-tiered hierarchy that starts with the high and sacred utama, then the everyday space of madya, and then the lower and impure nista. Each level corresponds to the landscape. First there's Mount Agung, the volcano and island's revered highest peak, then the lowlands, then the sea. There are a lot more examples like these. 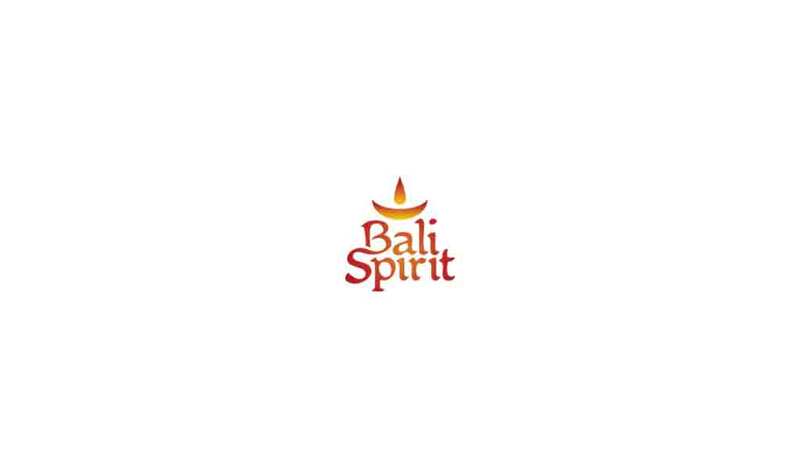 Om is the most important sound in Balinese Hinduism. Also known as Omkara, every mantra and every prayer starts with it. 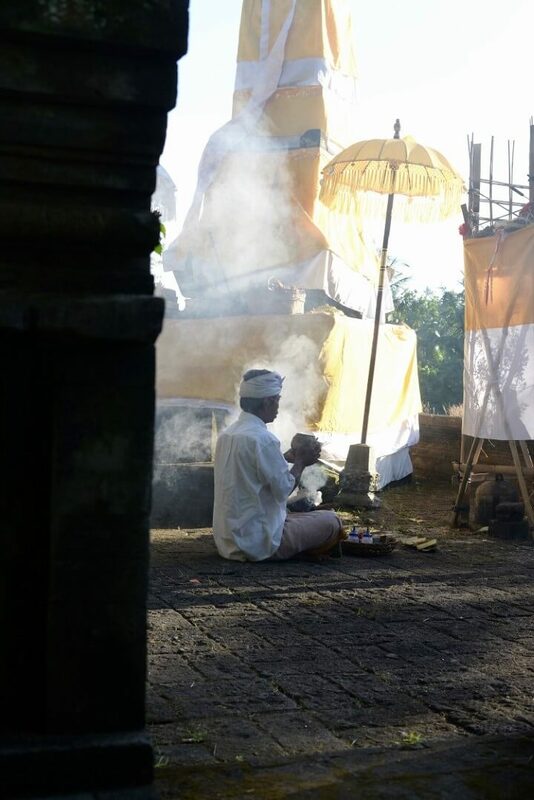 Balinese usually pray three times a day: 6am, 12pm and 6pm. At these times, one could have the chance to hear the mantra and the chanting of Aum. 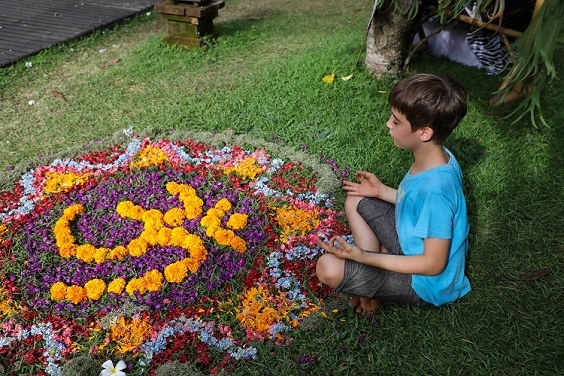 Also, the symbol of Om is included in the traditional Balinese greeting Om Swastiastu, usually written on white sacred linens hanged in the local temples. Omkara in Bali is considered as a tool for concentration toward Sang Hyang Widhi, the equivalent of Brahman in Balinese religion. 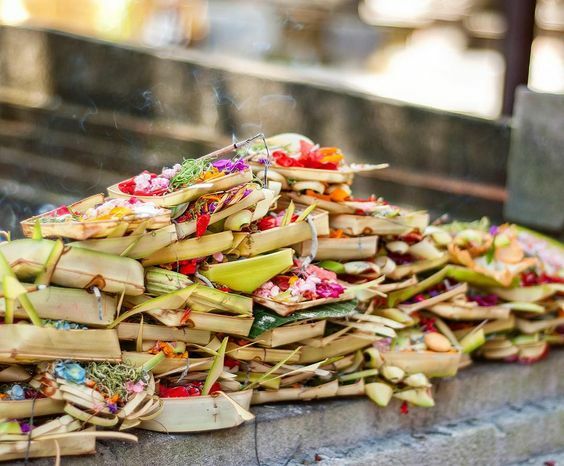 Also, there are five types of Om symbols in Bali, Omkara Gni, Omkara Sabdha, Omkara Mrta, Omkara Pasah and Omkara Adu-muka, used in different types of ceremonies in order to obtain magical powers required to manifest the intention of the prayer. The Balinese symbol of Om is divided in five elements, representing Hyang Widhi. 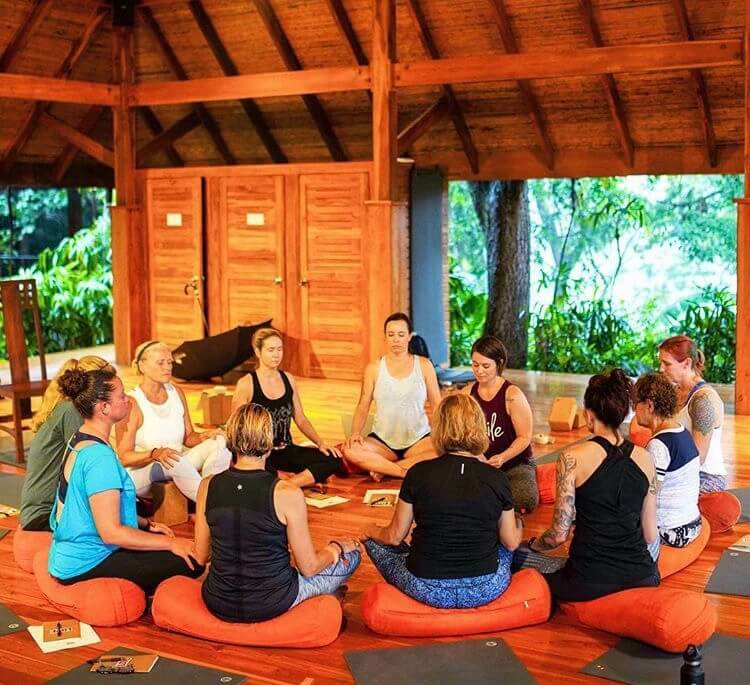 Spirituality and timeless culture: that’s why more and more people love Bali and that’s why it has become a mecca for yogis and yoginis. Here the sacred sound of Aum permeates the yoga shalas lost in the lushious jungle and overlooking emerald green rice fields. A chant that means “everything” and that sends the personal intention to the all reality of nature and the principle of the Universe.